“The Daisy Mae is the closest you can get to Z-drive maneuverability, without the cost of Z-drive,” maintains her builder Joseph Rodriguez of Rodriguez Ship Building Inc. in Bayou LaBatre, Ala.
Rodriguez has designed and built a lot of tugs over the years and doesn’t make this claim lightly. 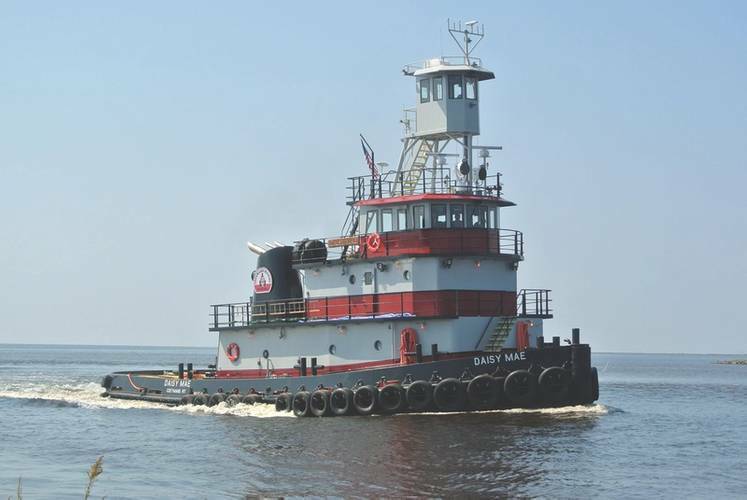 Further more he backs it up with his description of the beamy 82 by 32-foot tug that his yard delivered to Coeymans Marine Towing. This is one of the Carver group companies based at the Port of Coeymans 110 miles up the Columbia River from New York. The triple-engined boat is powered by a port and starboard tier 3 compliant Cummins QSK38 engines each delivering 1,300 HP at 1,800 RPM and a center-line, tier 3 compliant Cummins QSK19 for an additional 750 HP at 1,800 PRM. The two outside engines turn Kahlenberg stainess steel four-blade Kaplan style 75.25 by 80-inch propellers through Twin Disc gears, while the centerline engine is fitted with a 65.25 by 72-inch propeller with a similar configuration. Shaft brakes have been installed all three safts to allow rapid shifting fore and aft. All the propellers are fitted with Kort nozzles to enhance their thrust by as much as 32 percent for a bollard pull of 47.5 tons. With a maximum draft of only ten feet, the Daisy Mae will work comfortably along the Hudson River. With her model bow, she has better sea keeping abilities than a conventional riverboat. At the same time, she has riverboat maneuverability with tow flanking rudders on both the two outside props. The combination of powerful port and starboard engines with Kort nozzles on a beamy hull, together with the shaft brakes, foil-shaped steering rudders, and towboat style flanking rudders will give the operator of the new tug a lot of options for maneuvering in the river currents or tight harbors when towing, pushing or on the hip of barges. For pushing, the tug is equipped with a second, elevated aluminum pilothouse with a 41-foot above the water-line eye level. While for towing, a Markey towing winch, with 2,000 feet of 1.5-inch wire, is mounted on the aft deck. 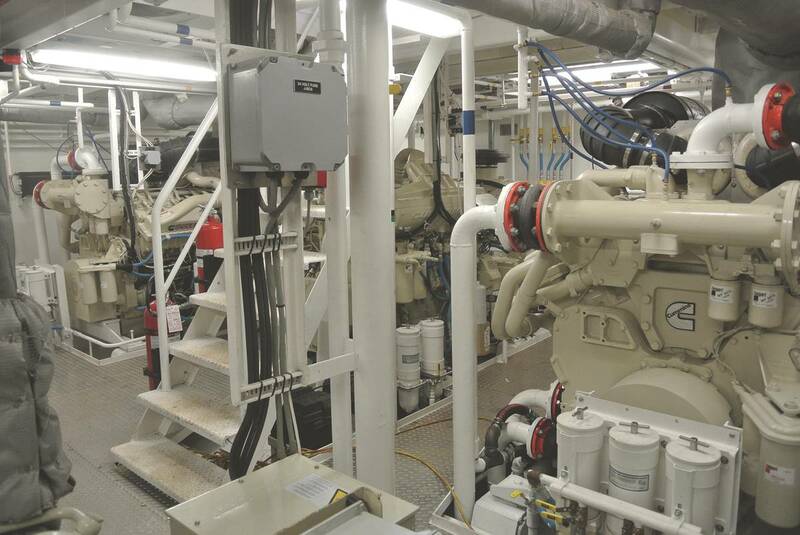 A pair of Patterson 40-ton deck winches is mounted aft for making up to push. Although built in the south, she is built for the north with heavy ice strengthened frames and plating forward. As an ABS load line vessel she has been stability tested and she is Sub-chapter M compliant including all required fire suppression systems. Accommodation is provided for a crew of five: captain, mate, engineer, and two deckhands. Tankage includes 33,000 US gallons of fuel, 8,000 gallons of water, 500 gallons of lube oil, 1,000 gallons of waste oil, and 1,000 gallons for zero discharge provisions. An extensive set of wheelhouse electronics includes two Halo 4-pulse compression radars, 16-inch touch-screen chart display, satellite compass, AIS, autopilot, depth sounder, and weather station all manufactured by SIMRAD. There are also three radiophones, a sat phone, and a bridge monitoring system. Electrical power is provided by two Cummins QSB7-DM powered 60 kW generator sets.